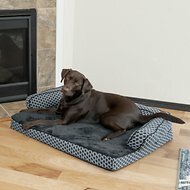 With the FurHaven Quilted Fleece & Print Suede Chaise Lounge Orthopedic Dog & Cat Bed you can pamper your pet while he sleeps, thanks to the plush luxury of a quilted fleece sleep surface with a soft and warm suede bolster and sides. 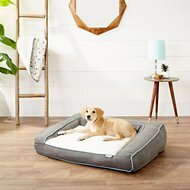 With a design that hides dirt and pet dander better than traditional pet beds, this chaise lounge also adds a chic flair to your home’s décor while its shape provides the perfect napping haven for your furry friend. 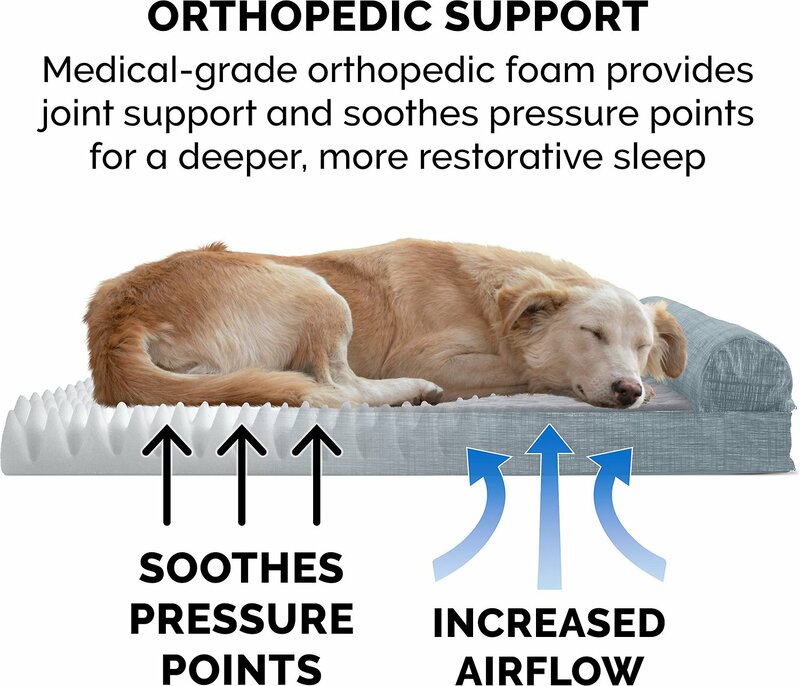 And the soothing comfort of the orthopedic egg-crate foam base relieves aching joints, prevents painful pressure points, and bolsters your pet’s neck and spine with the pillowed edge as he happily snoozes the hours away. 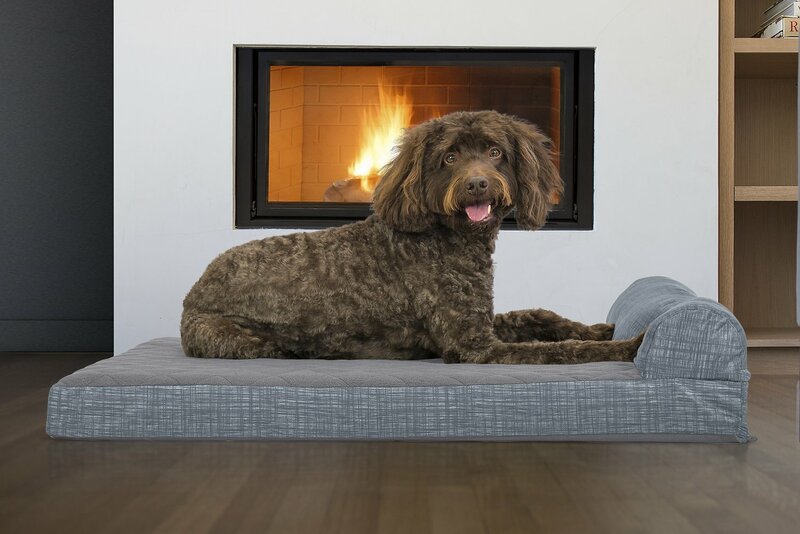 Plus, the cushy sleeping surface feels oh-so-nice on delicate paws and noses! 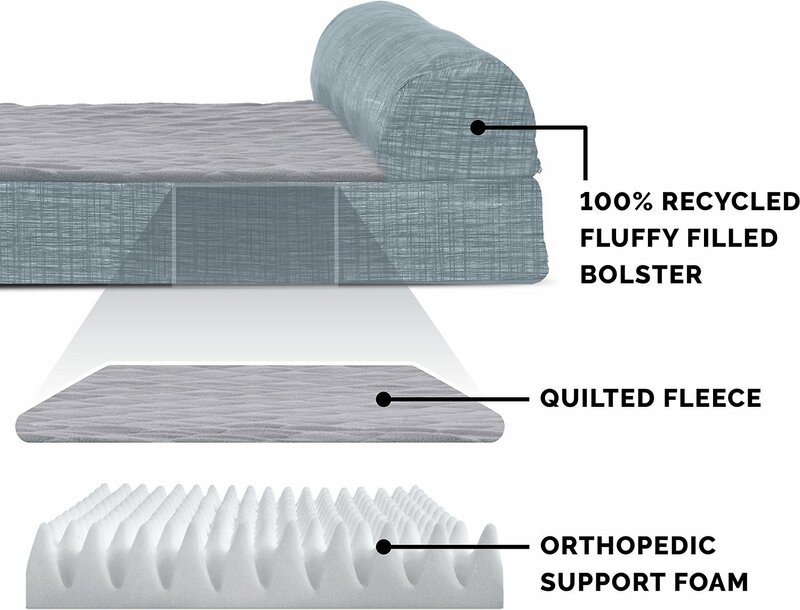 Made from medical-grade orthopedic foam that cradles sleeping pets and helps to prevent painful pressure points. Remove filling (foam core). Zip close. Fiber filled bolsters should not be washed. Foam can be spot cleaned with mild soap as needed. Hand or machine wash separately; cold water. Do not bleach. Line dry or tumble dry low. Foam can be spot cleaned with mild soap as needed. Press excess water from mat. Air dry. Do not wring. Do not machine wash foam. While my cat loved the bed (so much that he marked on it the first day, to my dismay) I wasn't thrilled when I washed it. I took the foam insert and the stuffed pillow out, but the pillow section -dividing the bed and pillow- disintegrated in the wash (gentle cycle) and the bed no longer had a separate compartment for the bolster pillow; it just became one large cover. Bought this for our Ginger a bull dog who we rescued she was abused to the point she has no control of her bm’s And has to wear a diaper . Very sweet lovable dog; I am always trying to find things that she loves and enjoys. she loves sucking on her bed or blanket as she falls asleep been looking for something bigger for her since she out grew the bed we have will be buying a new one soon. I ordered this for one of my senior dogs. She absolutely loves it! It's also easy to wash & is water resistant. Great for dogs who may have a slight incontinence issue. This is no where near 7.5 inch thick, more like 2 inches at best. My 45 lbs. dog sinks right to the ground. Disappointed! Have to large dogs 59 lbs and 80 lbs, before I could totally unwrap it and put it on the floor one was already trying to get on it. At night one sleeps in my room and as soon as he is there the other one is sleeping on the bed for the night. Will have to order another one. I ordered the largest one. 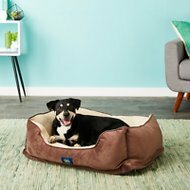 Tried this bed for my 13-year-old arthritic pupper Dauntless. We started with one and now we have THREE. Now thinking about a fourth. Our old dog seems to love this bed! At 14 years old, he struggles to get up, but it seems he has less trouble with this bed. Washed once and it tore apart. Very disappointing because my dogs absolutely loved it. Climbed in it the very first night....he loves his new bed and still shares with his brothers....good boy !!! I think you can get better quality beds for your money.